I find a few moments to write not because it is something that I even have the time to do, but more because if I don’t write now, I am afraid to lose the precious, tragic stories and sights I have witnessed in the last few weeks. During the past weeks I lay down to sleep between 2-4 a.m. to the sounds of tanks clunking over the pavement, sporadic shooting – noises of the night that Palestinian ears can distinguish in the flash of a moment — and a mind bursting with thoughts, scenes and stories that keep me from unconsciousness even longer. The morning begins with laughter as a friend tells me that he likes to watch Tom and Jerry because it makes him smile. “Why do people watch Rambo? We see that everyday—here it is not TV, it is real.” When Internationals first arrive they are often baffled by the military machinery waging this war, but the novelty wears off so very quickly; loss of appreciation frequently goes hand in hand with habit, routine and repetition. Today alone, I saw over 15 tanks, 7 apcs, a number of jeeps, 30+ soldiers armed with M-16’s and a Land Rover full of commandos. This is life here. Children 2-3 years old know the words for soldier, tank, shooting, prison, and death; slowly and surely war creeps into their beings. The children play “war” frequently. One mother told me the other day—“The terribly sad thing is that they always want to be the Israelis, no one wants to be Palestinian, to be controlled, to be the victim. These little children know who has power.” Another woman tells me of her discussion with a group of children about life, saying that first children talked about problems they are having—not sleeping, nightmares, constant fear—but then the conversation turned toward dreams and desires. In the midst of talk about parks, toys, and summer camp one girl raised her hand and said: “We need some milk and bread.” Despite their disturbing loss of innocence, children still manage to help me leave the mental space of many difficult realities; by playing with my hair, laughing at my Arabic, or simply sitting on my lap, they help me continually find healing, rejuvenation a! nd great hope. The people of this land are in dire need of humanization. As I become closer to the Palestinians living in Nablus and simultaneously start seeing the same soldiers and developing a rapport of sorts, I can’t help but feel that the situation, this ongoing, long going war is profoundly tragic. One afternoon we were attempting to get food and medical supplies to an occupied house in an area where the Captain has threatened us with arrest. There is an apc at the bottom of a small hill about 300 feet from the house, where the soldiers demand that the Danish man and I are to stay, while Doctor Rassem and Feras Bakri go to the house to treat the child. Perhaps this is so we don’t see the state of the home, or perhaps they suspect we are journalists, or perhaps it is simply about power and control—in any case, our goal is to care for the child and both Feras and the Doctor feel comfortable going without us. I watch as the ambulance heads up the hill and begin a conversation with the soldiers about “problems” in Nablus and how they feel about being here. These two young men were insistent on the fact that they want to go home, that they think over 95% of Palestinians are good, that they want peace for their children: “I just don’t want my children to ride the bus in fear” Michel says. They talk about going out, dancing, not having showered in days and sleeping on the floor. They say they only shoot armed people. I ask about a recent death in Balata refugee camp where a 24 year-old was shot in the head by soldiers in a jeep. Maybe he had a gun they say; maybe rocks, I reply. They share hopes for the future and claim that there is a violent cycle that is incessantly repeating itself here—suicide bombing, invasion, bombing, invasion… I ask how they think they are helping end the problems and they say “By being here—no bombings in 20+ days.” “And when you leave?” I ask. “Or do you plan to stay forever?” They seem completely ignorant of their role in creating further bombings, blind to the fact that they are only rendering a population more desperate, more hopeless, and more deprived each and every day, pushing people towards the “nothing to lose” state that a suicide bomber has invariably reached. And then it is time to change shifts and three new soldiers pull up in an apc and these two men, Michel and Avi climb into the new apc and head into town to do I can imagine what. These interactions put faces to these monstrous military machines; I think of the apcs that only a few hours earlier terrorized an adjacent neighborhood; during house searches soldiers took one man and beat him for over 30 minutes. I saw him this morning and now I see Michel and Avi beating any one of my Palestinian friends and I am left in total confusion. These are just young men beating, shooting, and terrorizing other young men because they see the “enemy.” Seeing humanity makes the destruction of life seems so senseless, so unbelievable. I think that is part of our work here, each one a tiny thread weaving humanity into hearts, souls, minds, and moments and trying t! o shelter the remaining flickers of hope from the wild wind of war. One of my dearest friends Khowla was walking by my side the other night, discussing dreams and talking about her youth. “When I was young I had so, so many dreams. I wanted to be a lawyer, to study biology, to go to university, travel, and learn about everything. But Susan, when you see the situation go from bad to worse again and again and again, all your dreams get broken.” She is only 21. There is still so much time, I say as I squeeze her hand. The director of the Ministry of Education, Juman Karaman, welcomed us into her home a few days ago; she lives in a home adjacent to one that is occupied, where we were headed. She explained how very far behind the students were due to constant closures and called this second term “a complete catastrophe”. Final exams were scheduled for June 17th -July 4th, but Nablus was invaded on June 20th; exams were put on hold and students have been in the state of exam preparation ever since. When curfew is lifted for a few hours—which has happened for a total of 30 hours in the 42 days (in Israeli prisons the detainees are given more than an hour/day recreation)—students rush to the school and take an exam. They are currently waiting for another curfew lift, to finish their exams, studying now for over a month, and never knowing what day they will have to perform. During the last week, the city of Nablus had been rather quiet during the day and many people had been breaking curfew, coming out of their homes to open a shop or buy a few things. The night is still plagued by military operations, the sounds of tanks, gunfire, and surreptitious movement. The villages have been the focal point of the military during the past days, as they claim to be hunting the “terrorists” responsible for this or that suicide bombing or settlement incident. “They use the same stories again and again, killing the same terrorists three, four or five times,” the press tells me a few nights ago. The villages lie to the southwest of Nablus, little clumps of homes nestled in olive groves and rolling hills, accessible only by thin dirt roads. This week, they spent three days going village to village looking for anywhere between 3-8 men. They killed three men the first day and denied the ambulance access to the bodies. A group of us went out to Sara village and attempted to get the ambulance in just to take the bodies but they told us we had to wait until they had finished their operation. Our refusal to leave was met with physical force: kicking, hitting and shoving 20 nonviolent activists come to simply take the dead. 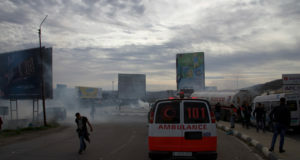 The next morning I went with the ambulance to get the bodies, as the Israeli army had finally given their okay. We wandered up a hill to an olive grove and found a very large group of men there, being searched and sorted into two groups. They had come to see the bodies and help and ended up being subject to search and arrest. They were separated into two groups, those 15-50 (over 75 men) and the very young and very old (over 45 people). ID’s were taken and the men all sat on the ground waiting as about 20 soldiers milled about and the paramedics waited for the final okay to head up 100m to the bodies. As we watched this process, counting the men and asking the soldiers questions, we saw another group of over 60 men being led down the hill towards the paved road. We are finally allowed to go get the bodies and as the medical team moves up the hill, the men who had been sitting down get up and follow en masse. We all arrive at three mounds covered by off-white tarps that are removed by the paramedics. People crowd to see who the dead are and chaos reigns as people move from one to the other. One man has a large hole in his head and his brain is literally oozing out. The second has no leg from the knee down and several large bullet wounds in his chest and groin. A third has an enormous hole in what was his forehead, and we all see that his brain is completely missing. No one knows the men, thus they think they must be workers who pass through the villages to avoid checkpoints and soldiers; they are certainly not terrorists. I ride in the ambulance to the morgue at Rafidia hospital, sitting in the back next to the b! odies, overcome by the smell, by death. We return to the Union of Palestinian Medical Relief (UPMRC) center where I sit for a moment, trying to catch my breath and find a few words; awoken from my somber silence by a call to tell me that soldiers have left Sara and are now in Tell. We have to move. During this time, three internationals have gone with the men, the 60 or so, who were rounded up and kept on the paved road. They had been led through the hills and back roads two by two, all their ID’s taken and eventually large trucks come, handcuff and take the men to a local military base. The three ask to be arrested with them, but the soldiers don’t want any internationals today. They return to Sara village on foot and while talking with locals hours later, hear cheering and find that the large majority of these men have come back. The leave to meet us in Tell, a village 1 km from Sara. Tell is in the same situation—foot soldiers wandering in the fields, snipers on the hills, tanks, apcs, and jeeps patrolling. I ask a soldier at a tank “What are you doing today?” “There are three terrorists free.” “But you killed three men yesterday….” “There are many.” We continue down the road towards Tell and come across an apc, two large trucks, and soldiers forcing handcuffed Palestinians inside. This is the Tell round up….taking all the local men for interrogation. We walk towards them, but they are leaving, and so we deal with what they have left behind: 9 donkeys, dozens of jars of traditional yogurt, and scattered possessions. We set off with the donkeys and belongings towards Tell to meet the other internationals and the medical team that has gone to deliver vaccinations. The military operation in Tell seems to be coming to a close; the jeeps and apc! s have left and so we return to Nablus, leaving a few behind to sleep in the village. In the village we find that the large majority of the men have been released but the remaining men cannot get their ID’s back. It is clear that one of the three jeeps is ready to leave with the ID’s so volunteers sit on the ground to block its path. 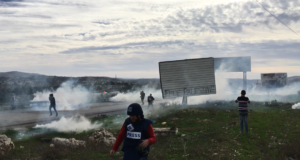 We are able to thwart the jeep movements for a while and create quite a scene that the Palestinians support, saying whether we go or stay they will have problems, so we might as well stay. The jeep and soldiers eventually manages to remove enough Internationals to pull forth; they return the ID’s to the men and leave us talking to the Palestinians. 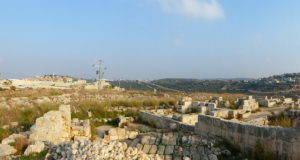 We split in two, some staying the village, some walking back into Nablus. We have been doing a lot of roadblock removals during the last few days. The Israeli army has closed every single village repeatedly and the internationals staying in Iraq Boreen heeded the locals call to remove these road blocks. A group of nearly 40 of us headed out to Tell, Iraq Boreen and New Nablus and removed three roadblocks one morning. It was incredibly beautiful to watch this simple success—working for a few hours and then watching as water trucks, vegetables and taxis begin to pass—encouraged by the sound of our clapping and the smiles of resistance. Palestinians at the Iraq Boreen roadblock then asked us to come to Salem village, where we helped remove three other roadblocks. We left a few people in the village who called an hour or two later to say that an apc and tank had come and a bulldozer was reported to be on its way. We moved quickly and had internationals there in time to block the bulldozer. 5 people sat on the ground and the bulldozer was unable to re-do the roadblock; the jeeps however did come and the soldiers began threatening arrest. After 30 minutes they begin taking the men, one by one, quick cuffing each one (with plastic handcuffs) and blindfolding them. They were put in the back of an apc and taken to Huwara military base (released hours later from Huwara after refusing to say anything). We stayed in the area until they left knowing they would bulldoze during the night. The day after we! came again to remove the road block and will continue this resistance as long as the Palestinians want to do so. The quiet has been replaced with the familiar sound of tanks, jeeps and shooting again. The bombing yesterday at Hebrew University in Jerusalem has led to a greater military presence and 4-5 people were injured today from tank machine gun fire, one of them this morning right in front of my eyes in Balata refugee camp. What are they doing? One might think the Israeli army targets certain people, or roams the city with a military aim. The reality is that a very large part of their work is about terror. This morning in Balata, they came in jeeps and began tear gassing everyone in sight for over an hour. Balata is one of the only places in Nablus that actively resists the Israeli army and succeeds—the children and young boys throw stones and impede the tanks from entering into the camp regularly. Our role this morning was not to negotiate or approach the tanks but rather to be witnesses, and attempt to discourage shooting by putting our bodies on the line. Two tanks are sitting in an open field at the southern entrance of the camp; the children and boys are 50m from them with us. We make ourselves visible and watch as the children and boys throw stones and push the tanks back. The tanks play cat and mouse for over two hours with the youth, racing forward and shooting in the air, rushing the crowd and letting out huge smoke clouds, then pulling back as the children race back out to throw stones. After over two hours of this we retreat back 3-4 m to some shade and sit as most the Palestinians mill about, seeming tired of these games. All of a sudden there is tank machine gun fire directly overhead us and shrapnel hits a 17 year-old boy in the head. I turn and see blood pouring down this young man’s face, 1m in front of me. Everyone runs with him to a nearby clinic and the Internationals watch them go and turn towards the tanks that begin to retreat. What kind of military operation is this? All day they have been wandering the streets, firing at will and terrorizing. Things are closed again despite the fact that today marks the 14t! h day straight without any lift of curfew—two weeks without even an hour to go outside. Israeli, American made F-16’s bombed Gaza and we watched Aljazeera news, as the numbers of those dead and injured rose ever higher, reaching over 170 (155 injured and 15 killed) by 2:30 a.m. when the news broadcast ended. I sat with 7 young Palestinian men at the UPMRC center watching the people shift through the rubble looking for more and more bodies, and then flashes of the hospital in total chaos. Horribly, graphic images flashed across the TV screen, especially of children no longer recognizable as human, but I was most touched by the young man next to me, as I watched one tear roll down his cheek, and felt that I too, was going to cry. Israel had agreed to pull out of the cities in the West Bank as part of recent negotiations and Hamas and Islamic Jihad had just called for an end to suicide bombings that night. Midnight rolls around and Israeli forces bomb an apartment building without any prior warning and with complete and total disregard for the lives inside, with the very intention of destroying them. The morning after, Hamas, Fatah, PLFP, and Islamic Jihad state loud and clear: Israel is not ready for peace, does not want peace. Suicide bombings are sure to follow. Can the world not see that Israel does not want peace? I can only imagine how this horrible incident is being spun in the U.S. Incessant stories about a Hamas member with little to no mention of the entire BUILDING of civilians. I bet no one in the U.S. saw the mangled children being shelved away at the hospital morgue,! the father who went mad as he watched his son die on the hospital bed, the young boy with a severely charred leg, or the mother lying covered in blood, an oxygen mask over her face and child on her lap. What kind of a war is this? “They are trying to make life as unbearable as possible,” a friend tells me yesterday, “Economically, medically, psychologically, and physically.” That night we saw the creation of hell on earth–hatred, evil, fear, and terror. “Where is the peace?” someone says…..but everyone is silent. This adorable 70 year old man from a nearby village greeted me the morning after. He asked me only: “Did you see the children?” referring to Gaza. I say “Yes” and watch as tears well up in his eyes and continue speaking for him. Imagine everything that he has seen in this lifetime and yet still, the loss of life, the death of innocent people, the killing of children makes small streams of salt-water flow from his soul. Sharon and the Israeli government are not going to end this war; it is not in their interest to do so, as they may actually be forced to share this land. The cycle of violence seems to have no end in sight. We, all of us in the international community, must put pressure on our governments to TAKE ACTION NOW. There are many ways for you to help wipe this man’s and this land’s tears away. Make one call, send one email or letter today. The sounds of machine gun fire, tanks and occasional explosions echo through the windows from the streets in the heart of Nablus as I go to send this—it is only 11 p.m. Don’t wait until tomorrow to do something—the time is now. This simply must end.